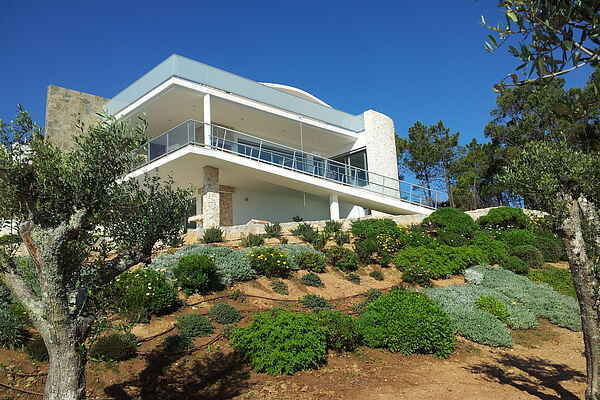 Superb design villa that boasts a panoramic view over the Portuguese countryside. This large property offers a high level of comfort, including a private swimming pool (which is quite a sight at night when lit up! ), a large garden, several balconies and a full interior and exterior equipment. Four to six people will be staying very comfortably, thanks to the two bedrooms (one of which including as well a king sofa bed), and two neat bathrooms. The villas's geographical situation is very interesting: less than 10 kilometers away from sand beaches of the Atlantic coast or the Obido lagoon and about 1 hour drive from Lisbon. Besides spending a day in the Portuguese capital, you can also decide to spend some time in the local towns and get to feel a little portuguese yourself! Don't miss the parish of Caldas da Rainha with its restaurants, its market and its interesting architecture or Foz do Arelho, a former fishing village which is now rather touristic but where nice beaches and good good restaurants can be found! Nice drone impression of Sao Martinho do Porto, on 6km distance from the villa.